You are not alone. There is an amazing amount of support available to families with critically ill or seriously injured children. I hope this list helps you in your journey. This, of course, is just a small listing of resources that are available. What other resources helped your family? Please share in the comments. MN Preemie Parents Facebook Group – www.facebook.com/groups/MNpreemieParents – a safe, private group to connect and share with other Minnesota parents of kids with different needs. Spare Key – www.sparekey.org – Spare Key is a non-profit organization that helps families by providing housing grant assistance to families, allowing them to focus on their child’s recovery. Ella’s Halo – ellashalo.com – Ella’s Halo is a non-profit organization created to provide some of the comforts of home to babies and families during extended stays in Twin Cities NICUs. Faith’s Lodge – www.faithslodge.org – Faith’s Lodge provides a place where parents and families facing the serious illness or death of a child can retreat to reflect on the past, renew strength for the present, and build hope for the future. Women, Infants, and Children (WIC) – www.health.state.mn.us/divs/fh/wic – WIC is a nutrition program that helps eligible pregnant women, new mothers, babies and young children eat well, learn about nutrition, and stay healthy. Even though we were above the income requirements to qualify for WIC support, Jaxson automatically qualified because he receives Medical Assistance because of his low birth weight. My recommendation: contact resources, even if you do not think you will qualify to receive support – you just never know! Working Family Resource Center – www.workingfam.org – Working Family Resource Center (WFRC) educates and supports people to effectively manage the demands of work and family. Minnesota Parents Know – www.parentsknow.state.mn.us – Minnesota Parents Know is a resource filled with convenient and trusted child development, health and parenting information. 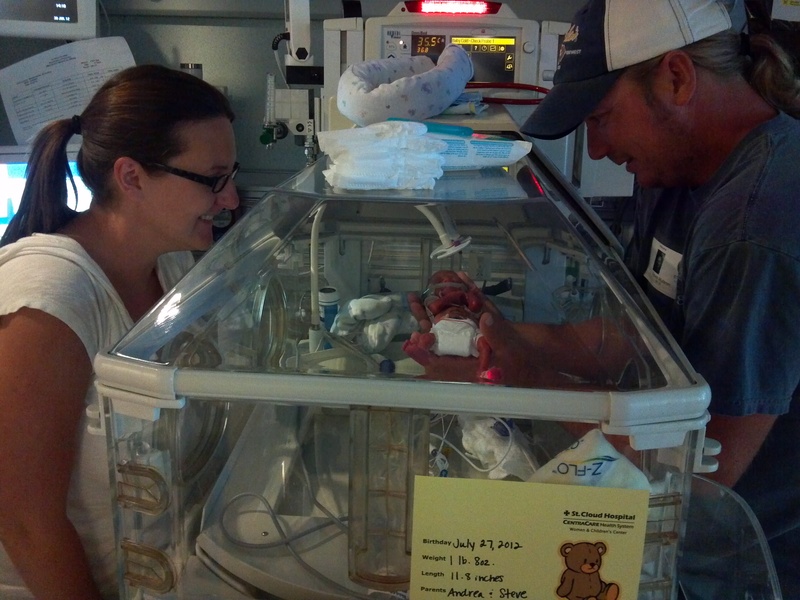 Minnesota Preemies – www.minnesotapreemies.com – An understanding community of local families of premature babies. Caring Bridge – www.caringbridge.org – CaringBridge is a free, nonprofit web service that connects family and friends during a serious health event, care and recovery. Life After NICU (Support Group) on Facebook – www.facebook.com/lifeafterNICU – A support group for parents who are going through or who have survived the NICU experience. Pathways.org – www.Pathways.org – outcome-based research and multimedia tools that promote each child’s fullest inclusion. This site gives parents knowledge to help with early detection and early intervention for children’s sensory, motor, and communication development. Hand to Hold – handtohold.org – Provides “comprehensive navigation resources and support programs to parents of preemies, babies born with special health care needs and those who have experienced a loss due to these or other complications.” You may find this resource especially helpful: How to Pay for Your NICU Stay.